The first US solar eclipse since 1979 occurred this past Monday, August 21st and it was the only one to span the country coast to coast since 1918. In our last blog post, we mentioned that the eclipse was partially viewable across most of the US. As USA Today mentioned, the journey in which the moon's shadow swept across the Earth's surface crossed parts of 12 states that made up the path of totality from west to east: Oregon, Idaho, Wyoming, Nebraska, Kansas, Missouri, Illinois, Kentucky, Tennessee, Georgia, North Carolina and South Carolina. More than 15 million people live within the totality band, and another 68 million live within a 2 hours drive of it. We thought it would be interesting to see how congested national parks, campgrounds, major cities and rural areas within the band of totality would get during the eclipse. We also looked at drive areas up to two hours of the center of the path. We pulled together a visual analysis of what we saw and where people came from. Below is a snapshot of population density on August 14th that represents a typical day. As predicted in our previous blog, there was a large increase in crowd density in areas inside or close to the totality path. Our device activity numbers show the population in the totality swath rose significantly. The largest increases were seen in Nashville, Kansas City and St. Louis. Also as predicted, national parks, preserves and monuments were popular destinations for viewing the eclipse. Some of the most heavily visited ones were Craters of the Moon National Monument & Preserve in Idaho, Great Smoky Mountains National Park in Tennessee and Grand Teton National Park in Wyoming. Overall, activity across the totality path was up 34% compared to the previous Monday. Within a two hour drive of the path, foot traffic was up 23%. While we saw people travel from far and wide, there were differences in patterns of movement north and south of the path of totality. We found that states to the south, specifically Florida, Texas and California, had more in-migration on the day of the eclipse than the largest states in the north, New York, Pennsylvania and Michigan did. How did we get the analysis? One of the data structures Skyhook uses for analyzing US data is the US Census block group. A block group is the smallest geographical unit for which the bureau publishes full demographic data and each one contains between 600 and 3,000 people. 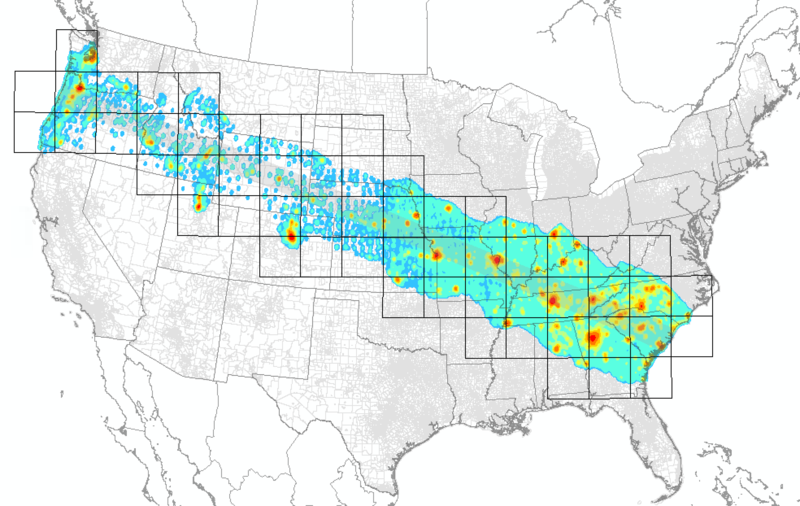 There are around 220,000 block groups in the US and around 10,000 of them went dark within the path of totality during the eclipse on Monday. Our depersonalized and de-identified device data map below shows where all detected devices within these 10,000 block groups that make up the light orange band come from on a typical day. 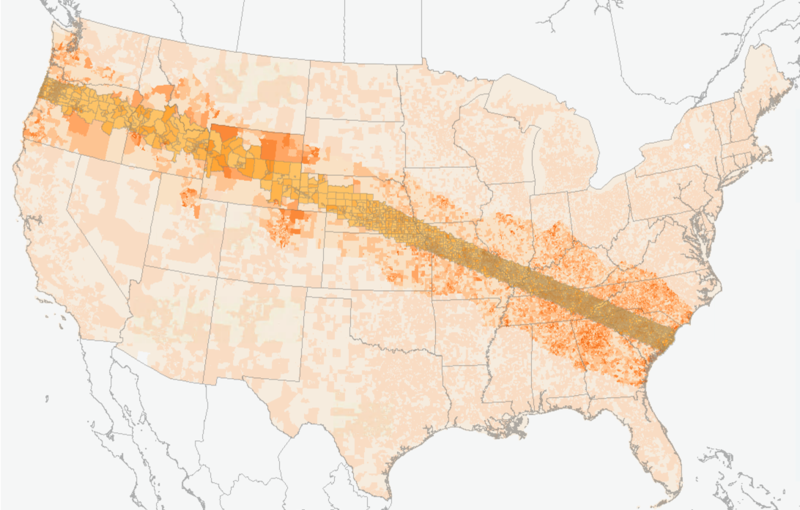 The darker orange clusters on either side of the band show the devices present within an approximate driving distance of 2 hours from the path of totality or less. For each census block group this map shows how far from home the detected users were between 11am and 2pm on Monday, August 14th.